Solid, liquid, or gas? Which are you? Everything around us is in one of those three states. What exactly does it mean to be a solid, or a liquid, or a gas? Good question. A solid is a sample of matter that retains its shape and density when not confined. A liquid is a sample of matter that conforms to the shape of a container in which it is held, and which acquires a defined surface in the presence of gravity. A gas is a sample of matter that conforms to the shape of a container in which it is held and acquires a uniform density inside the container, even in the presence of gravity and regardless of the amount of substance in the container. If we were to compare the people of this world to molecules, I think most would be in liquid state. Free to float about, held in place only by external forces, but never really bound together. This is what our world is now, but I think that we are moving toward becoming gaseous. Our society has become more and more mobile as technology increases, and people talk about easy transportation and Internet as things which make our world "smaller." But in reality, they don't make our world smaller; they make us bounce about frenetically like gaseous molecules. We are becoming a people who randomly bounce about, running into more and more molecules, but never attaching to any of them. We are becoming gaseous. But for those of us who are Christians, we are called to something completely different than this. Not liquid, not gaseous. Solid. We are called to be part of the church, a structure which, while living and breathing, has an architect who has fitted us together, and we are bound together. Something solid, something permanent, something unbreakable. Most people in our society don't want to part of a structure, for a structure binds us, and makes us less free. At least...that is what they think. But even liquids and gases are bound -- they are bound by externals -- a pitcher, a glass, a room. And those which are bound by nothing eventually become utterly lost and alone. But in a solid, no molecule is ever alone, and every molecule is part of something bigger and grander than itself. And, unlike water and gas, which shift and change depending on the container, the bonds which hold us together will never change, will never be broken. 2:4As you come to him, a living stone rejected by men but in the sight of God chosen and precious,5you yourselves like living stones are being built up as a spiritual house, to be a holy priesthood, to offer spiritual sacrifices acceptable to God through Jesus Christ.6For it stands in Scripture: “Behold, I am laying in Zion a stone, a cornerstone chosen and precious, and whoever believes in him will not be put to shame.”1 Peter 2:4-6 tells us that we come to Christ to be built up as a spiritual house. Christ is the bond which holds us together. He is the foundation upon which we are built. And, "whoever believes in Him will not be put to shame." It is interesting that, in our free-flowing, frenetic society, being "bound" is considered to be a bad thing, but it is only as you take your place in the structure which was designed for you that you discover what you were really made for, and how your life can be both fulfilling and free. 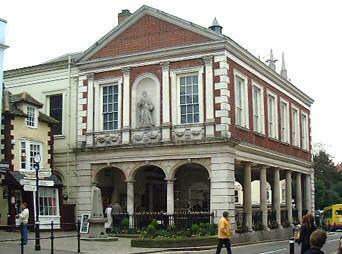 In the 1600s (aproximately 1688) Christopher Wren, a well-known architect, was commissioned by the Windsor town councillors to build the Windsor Guildhall -- a picture of which is shown below. As you can see from the picture, the ground floor of this building is completely open, with the main part of the building being supported by eighteen pillars around the edge. This open space was designed to be used as a public market. When the town councillors saw what Wren intended to do, they (in their infinite architectural wisdom) protested to the great architect that his design would never work. Eighteen pillars would not be enough to support the weight of the building, and the whole thing would collapse. Christopher Wren insisted that his design was solid and safe, and an argument ensued. 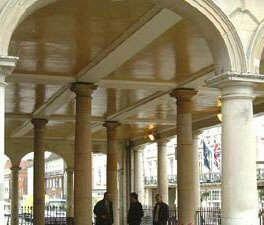 The upshot of it all was, Christopher Wren agreed to add four more columns into his design. These four columns were interior columns, and can be seen in the picture below. But Christopher Wren had the last laugh; when he designed the four inner pillars, he deliberately designed them to be two inches too short; the tops of the columns do not even touch the beams of the ceiling. They bear no weight at all! But Christopher Wren obviously knew what he was doing; for centuries this building stood strong and tall without those center columns supporting any weight. The book of I Peter describes the church as a building -- not made of stone, but of living stone. We, as Christians, make up the structure of the church. Just as people rejected and disbelieved Christopher Wren's architectural plans, mankind has rejected the foundation (Jesus Christ) upon which God is building His church. But our foundation is a foundation which will never disappoint, and the structure built on that foundation will never collapse. But God is not like Christopher Wren; unlike Wren, God has not put any "useless" columns in His church. The book of Ephesians tells us that we are all being fitted together. There are no useless or unimportant parts in God's building. We each have a part to play, a work to do, a section of the building to support. And when we choose not to do our part, the whole building suffers. If we refuse to bear the weight given to us, the building will not collapse, but another -- stronger -- part of the building will have to carry the burdens we refuse to bear. In other words, our choice to not do our part in God's work is a choice to place a heavier burden on the back of another part of the church. When I was a kid, our house had a kitchen and a dining room, and there was a wall, with a doorway, between the two. That wall is no longer there. At some point while I was growing up, my parents decided they'd had enough of that wall. They wanted to have one large, wide open room, instead of two smaller rooms. So dad took a sledgehammer to the wall and knocked it out. Of course, when they built the house in the first place, they knew that someday they might want to get rid of that wall, so they were careful to build the house in such a way that this wall was not a load-bearing wall. It was supporting nothing. Nothing else anywhere in the house depended on it. It was, in a nutshell, useless. 2:4As you come to him, a living stone rejected by men but in the sight of God chosen and precious,1 Peter 2:4 adds to this image by telling us that we are not just stones in a building, but we are living stones, growing together as God has fitted us together. But as God is building His house, He is not putting in any useless stones. There is no part of His church that He could point at and say, "That living stone there doesn't support anything. Nothing else in My house depends on that living stone. That living stone is, in a nutshell, useless. I could take a sledgehammer to that living stone and it wouldn't affect anything else in the building." The loads we are each given are not unbearable, or unreasonable. But they are our burdens to carry. And in carrying our own load, we support and strengthen all the other living stones in the building with us, strengthening the entire structure. It is an exciting realization to understand that we are fitted so perfectly together by God, but with that realization comes an exciting responsibility as well -- to build up, strengthen, and support the living stones all around us, who shoulder their loads side by side with us.